let’s eat Vietnamese food kids!? 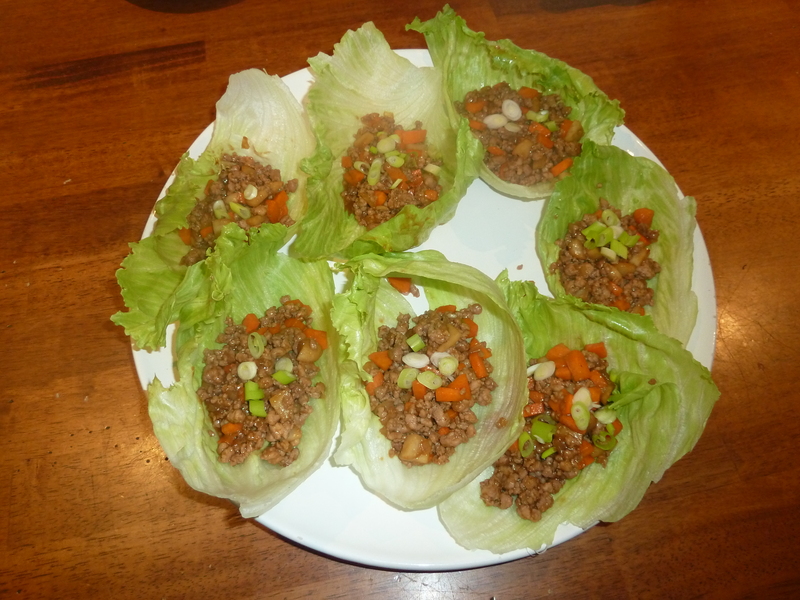 The other night I made San Choy Bao with pork, otherwise known as Lettuce Cups for an easy Friday night dinner. Thinking it would be a good idea to get the kids trying and tasting Vietnamese food before we go away in July. They were surprisingly easy to make – just wok all the ingredients together and da-dah – ready to eat fresh San Choy Bao. Yumbo. Steve and I loved them but the kids…well let’s just say they looked at it with scrunched up faces. No…I don’t like that! It’s green (amazingly yes lettuce seems to be green in all countries). I couldn’t even get them to try it, just a little bit. My kids are usually good at “trying” things and if they don’t like it that’s fine. They’ve just got to try it. Oh well looks like I’m back to the drawing board or the kitchen for me. I’m hanging onto the premise that all will be okay when we’re over there – with no culinary choice – it will be the choice of eat what’s there or shed the kilos. And knowing my kids, my money will be on the eating choice. This is not stopping me from trying to cook up different Vietnamese foods. So if you have any great recipes from Vietnam, send them on please. The kids are so excited about travelling to vietnam that they have taken to reading the guide books i borrowed from our local library. Charlie girl, our 11 year old, has started her own journal, decorated the cover with a picture and a Vietnamese flag and has written down some of the common language phrases we’ll be using when we’re over there. She’s written down the numbers and how to order a coffee (for me obviously). i just watched them, all four kids on the floor in the littlies bedroom look at the photos, and try and say the words. They also found a US$1 and i converted it into dong on the internet…came up with just over 21,000 VND (Vietnamese Dong). The guides also said it would cost 30-50 cents for a beer, 50 cents for a coca-cola and mostly for an entire day we could all get away with $10 a day for all our meals. I did mention to the girls that there probably won’t be milk, cereal, chocolate and a variety of other fridge/shelf items available…they were gobsmacked! Just goes to show that the only way to truly understand and know about something is experiencing it yourself rather than reading about it in a guide book. Now I just have to locate a map of Vietnam and put it on the wall for us all to plan our adventure from our kitchen table . So it’s time for a spot of shopping. There were five stores all lined up in retailer fashion on the same strip – Kathmandu, Mountain Design, Snowgum and a couple of others. The kids, all four of them excited at the commencement of the retail journey, soon realised this was not going to be the shopping expedition they were used to from time to time at Supre or Factorie or even Target. No, this shopping experience was all about gazing long and hard at a wall full of dark-coloured, zippered bags and throwing them over shoulders and onto backs and unzipping them all one by one. Charlie our eldest daughter wanted the “women’s” styled backpack. It came with a wider area for the straps around the top of the shoulders so as not to crush the boobies. I think she really wanted it because she feels entitled to “women’s” products now since wearing bras and having noticeable chest now. She kept eyeing off the bright pink and yellow fake frangipani flower secured onto the pack itself too so it might have been the flower? Anyway, it was above our backpacking budget, since we were there to purchase SIX of them! In the end, we put some on hold so we could look at all the stores in the retail rich backpacking strip. Thank you to the very patient woman who served us at Mountain Design for packing up our mess of backpacks and bunched-up plastic. My youngest daughter jammed a ball of that plastic up her top to play with in the car on the way home. In the end we chose two 30 litre Mountain Design backpacks for the biggies (11 and 10 year olds) and two 20 litre day packs for the littlies (7 and 6 year olds). All happy (bar one who was still having a huffy-puff over not being able to purchase the most expensive “women’s” backpack for herself). In total we grabbed bargains all round with the summer sales on in January. We are not leaving until 4 July this year but thought we’d start the journey and get organised for our trip. I have already been to the local library and borrowed travel guides and picture books on Vietnam. The internet is a wonderful source of information, and also FB with friends responding to my video post of the girls receiving a BIG Christmas present on Christmas Eve – Air Asia tickets! Look at their reaction on this video. PS After getting home from our shopping spree, hubby pulled our old backpacks out from the shed. Everything still worked, well nothing that a spray of WD40 can’t fix and a soak in a bath full of Wool Mix. Last time they were used was in 1999 on our honeymoon to South East Asia. And now that makes six backpacks ready to travel.